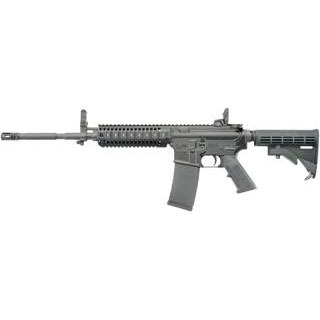 Colt LE6940 AR-15 Carbine SA 223|5.56 16.1 30+1 4-Pos Stk Blk in. Colts LE6940 features a freefloating 16.1 chromelined barrel that provides the enhanced accuracy necessary for longrange shooting. The onepiece monolithic upper receiver incorporates a continuous MilSpec rail from the rear of the upper receiver to the front sight. This delivers unrivaled repeatability for mounting optical systems not found with traditional handguard rail systems. LE6940 has a has a synthetic stock retractable from 35.5" to 32" Magpul MBUS rear sight folding front sight and a quad rail handguard for mounting accessories. The standard model comes with a 30round PMAG. The CA compliant model has a 9round magazine."